What We Do | Square One Design, Inc.
We actively support the creation of virtually any form of the built environment, beginning with development and initial programming, through the project management stage. Our clients are involved throughout the design process to ensure that the product reflects their personality and goal. This interaction combines both the dreams and aspirations of our clients with the creative talents of our designers to make the project into a reality. Whether you’re looking at new office space or evaluating whether or not to transform your current office space, Square One Design provides ideas and options to meet your space requirements. Our designers will work with you to help determine your needs, goals, budget and the most effective method of accomplishing your project. Often times a new design depends on having as-built drawings. Knowing what you have, where it is, and what condition it is in will help you make any decision necessary for reconfiguring of your space. Based upon your needs, Square One Design can create a variety of documentation ranging from a simple standard line item inventory to more complex drawings attached to a relational database. Our designers have worked with just about every type of furniture system on the market. When you’re wondering what type of system might best suit your needs, Square One Design provides experienced and unbiased information. This information enables our clients to create office environments that offer you choices of several lines of systems furniture, mobile furniture, desking systems, architectural wall systems, seating, storage, filing and freestanding case goods. Square One Design is pleased to work hand-in-hand with all contractors, architects and any vendors to ensure the design process is highly successful. We employ quality checks throughout the lifecycle of your project to ensure the completion meets agreed upon goals and customer standards. 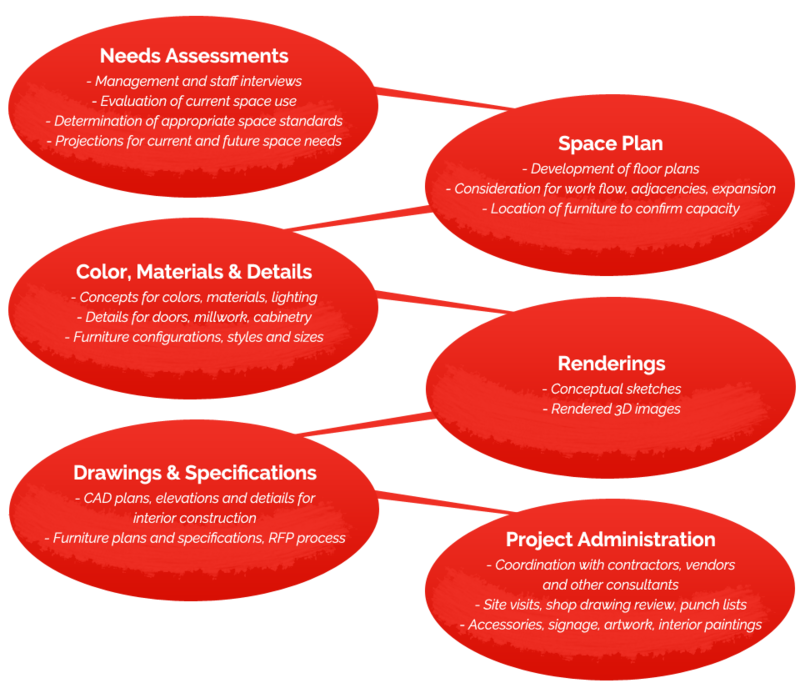 Square One Design has extensive experience with complex project management decisions. We develop implementation schedules and strategies to direct, manage and execute the project work. We implement a practical approach with the project team to assure that our client’s objectives are met on time and on budget.